Requests for transcripts, whether for a proceeding reported by a court reporter or for a proceeding recorded digitally using the CourtSmart system, should be submitted to the Court using a G-120 Transcript Order Form. How those forms should be submitted to the Court depends on how the order will be paid for and who is placing the order. Orders for transcripts to be paid for with Criminal Justice Act (“CJA”) funds must be submitted using the Court’s eVoucher system. All other transcript orders must be e-filed in the case using the Court’s CM/ECF system, unless the ordering party does not have the ability to e-file or is not a party or attorney of record in the case in which the proceeding was held. Please note that, if the United States is a party, and the United States Attorney or any Assistant United States Attorney has appeared in the case, the transcript order must be e-filed, even when the transcript order is initiated by an out-of-district AUSA. Detailed guidance on how to complete and submit the G-120 is provided in the document attached below, along with instructions for designating transcripts as part of the record on appeal. See below for transcript rates. In addition, parties must understand their responsibility to request redaction of personal identifying information from transcripts that will be filed and made available to the public through the Court's CM/ECF system. For guidance on the judiciary's redaction policy, please review the information available here. Complete items 1 through 19 of the CD/Tape Order Form AO-436. From the CM/ECF home page, click on either Civil or Criminal, as applicable. Click on Other Filings > Transcripts and enter the case number. Continue to follow the prompted screen messages until your CD/Tape Order Form AO-436 has been electronically filed. Submit your payment using pay.gov as prompted through CM/ECF, or mail your payment to the United States District Court - 350 West 1st Street, Suite 4311, Los Angeles, CA 90012-4565 - Attn: Court Reporting Services. Download and print CD/Tape Order Form AO-436, or obtain the form from the Clerk’s Office Intake window, and complete items 1 through 19. Submit your payment to the United States District Court - 255 East Temple Street, Los Angeles, CA 90012 - Fiscal Department, Suite 1178, and obtain a receipt stamp on the CD/Tape Order Form AO-436. File your completed CD/Tape Order Form AO-436, or mail your form along with your payment to the United States District Court - 350 West 1st Street, Suite 4311, Los Angeles, CA 90012-4565 - Attn: Court Reporting Services. Cashier’s checks, certified bank checks, government-issued checks, business checks and money orders on a major American bank or the United States Postal Service are accepted. Personal checks are not accepted. Checks should be made payable to: Clerk, U.S. District Court. All major credit cards are accepted. Please allow three (3) business days for processing from the date payment is received. Parties will be contacted by a Court Reporting Services staff member upon completion. 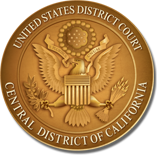 For further questions regarding a digitally recorded proceeding, e-mail courtrecording_cacd@cacd.uscourts.gov or contact 213-894-3015. A transcript to be delivered within 30 calendar days after receipt of an order. A transcript to be delivered within 14 calendar days after receipt of an order. A transcript to be delivered within 7 calendar days after receipt of an order. A transcript to be delivered on the calendar day following receipt of the order (regardless of whether that calendar day is a weekend or holiday), prior to the normal opening hour of the clerk’s office. Huntington Court Reporters and Transcription, Inc.